ST Y L E & B E AU T Y M A ISON PROUD Monaco is known as a posh playground for the global elite. Yet, down a cypress-lined avenue, tucked beyond the buzz of the glittering yachts, casinos and boutiques, a quieter form of luxury awaits at the Hotel Metropole Monte-Carlo and newly bowed Spa Metropole by Givenchy ( metropole. com/en/spa-montecarlo). e spa experience is crafted to evoke the creation of a couture garment with Monsieur Hubert de Givenchy himself. A pristinely groomed spa associate hands me a tablet on which I select not only my music and massage pressure preference, but also build my personalized mood board recalling the sounds, scents and visual elements that resonate most with my personality. Afterward, the attendant promptly delivers my signature scent—spritzing my personal pochette to wear in the pocket of my robe as I embark on the sensory journey. Nestled in one of the 10 treatment rooms, the indulgent Le Soin Noir Renaissance Intégrale unfolds over a luxurious two-hour symphony of massage and facial. Featuring the most precious of all the Givenchy skincare collections, Le Soin Noir employs algae as a regenerative agent, packed with anti-aging effects delivered through a trademark massage technique. For the grand finale, a cool blast of cryotherapy to refresh and renew the skin. In a day when true luxury is defined by experience and personalization, Hotel Metropole Monte-Carlo and Spa Metropole by Givenchy both deliver a customized experience that can only be compared to haute couture. "e secret to elegance is being yourself," de Givenchy famously said. Indeed, Monsieur. 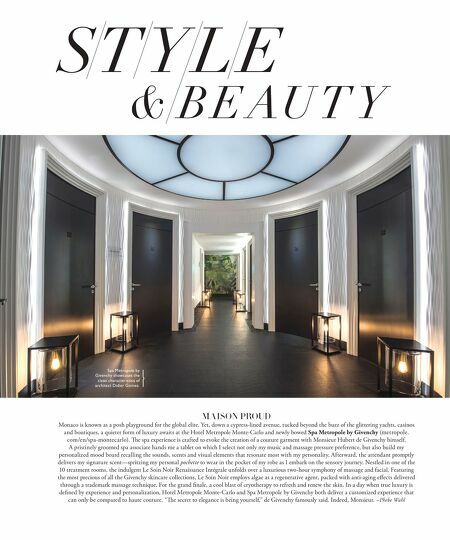 –Phebe Wahl Spa Metropole by Givenchy showcases the clean characteristics of architect Didier Gomez.